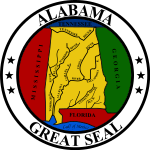 The 1976 United States presidential election in Alabama took place on November 2, 1976, as part of the 1976 United States presidential election. Voters chose nine representatives, or electors to the Electoral College, who voted for president and vice president. Alabama voted for the Democratic nominee, former Governor Jimmy Carter, over the Republican nominee, President Gerald Ford. Carter won Alabama by a margin of 13.12 percent. As of the 2016 presidential election [update], this is the last time Alabama has voted Democratic in a presidential election, as well as the last time a Democrat carried Madison County, Tuscaloosa County, Calhoun County, St. Clair County, Elmore County, DeKalb County, Blount County, Autauga County, Dale County, Coffee County, Chilton County, Escambia County, Covington County, Pike County, Geneva County, Winston County, Monroe County, and Cleburne County. This is also the sole election since Franklin D. Roosevelt eked out a one vote plurality in 1932 that a Democrat carried traditionally Republican Winston County, and the sole one since James Buchanan in 1856 that a Democrat won an absolute majority of the vote there. ^ "1976 Presidential General Election Results - Alabama". U.S. Election Atlas. Retrieved 21 July 2013.